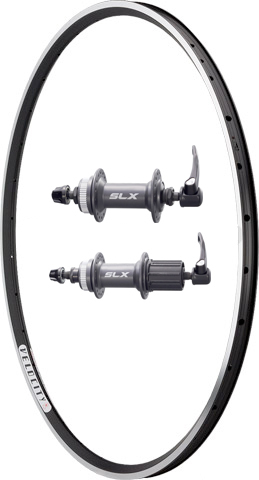 The best bang for the buck of all the Cyclocrossworld edition disc wheelsets. If you’re looking to break into the disc cyclocross world, there’s no better wheel that the SLX Disc Wheelset. We take a set of Velocity Major Tom tubular or Velocity A23 tubular rims, lace them to a pair of Shimano SLX disc hubs with DT Champion spokes and turn out a do-it-all wheelset for the budget minded disc brake rider. Compatible with centerlock disc rotors only. Compatible with Shimano and SRAM 9 and 10 speed cassettes.